The Helios chain will open a modern cinema in the Libero shopping and entertainment center. The multiplex will be created in compliance with the new premium concept of the chain including Helios Dream rooms. The chain returns to Katowice after the company closed cinema in Altus several years ago. Now it will invite over 1000 cinema goers to eight screening rooms. Two of them are the Helios Dream rooms. In the latest Katowice multiplex there will also be a premiere room that can hold over 300 film spectators. On the area of over 3 000 sq. meters Helios will prepare a modern facility for film fans, in which residents of Katowice and other cities of the agglomeration will watch films in the most advanced technologies, according to the chain. Two of them – Helios Dream rooms – will stand out a modern interior design and leather, electrically reclining seats, which each viewer will be able to regulate himself. The strong point of the Helios Dream rooms will also be images displayed in 4K resolution and Dolby Atmos sound, which thanks to dozens of independent soundtracks sent to speakers placed in different places of the room, also on a ceiling, will create a three-dimensional sound. In addition, one of the Helios Dream rooms will be able to display three-dimensional movies in the DepthQ 3D system. 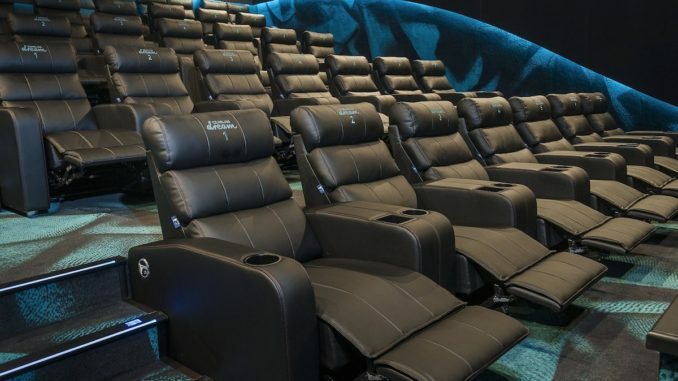 The hallmark of the cinema in Libero will also be the premiere room in which over 300 filmgoers will be able to watch the latest film productions. In addition to the regular repertoire, viewers of the Helios cinema in Libero will also be able to take part in special screenings: Women’s Cinema, Night Film Marathons, Connoisseur’s Cinema, Film Mornings or Cinema to the Point. Helios has prepared a family ticket taking into account family visits as well as attractive discounts as part of a “Large Family Card”. “After a few years Helios will open a cinema in Katowice again and it will be a great comeback. The multiplex in Libero, to which we will soon invite Silesian moviegoers, will undoubtedly be a unique cinema with a great atmosphere, special screenings and repertoire at the highest level. We want our new cinema in Katowice to be an important place on the cultural map of this city” – emphasizes Tomasz Jagiełło, president of Helios. Similarly to other chain locations, also in Libero, all rooms and the entire cinema space have been designed also for disabled viewers. In addition, Helios will also invite visually impaired and hearing impaired people who will be able to use an audio description system. “Helios in Libero will be a real treat for the most demanding moviegoers. We are happy that as one of the first in Poland we will have screening rooms Helios Dream with new standards in film reception. We have to admit that the multiplex will be a very strong magnet attracting to leisure and restaurant area, which is located on the entire second storey. We have wanted to connect shopping in a hospitable, functional and architecturally interesting space with the world of entertainment, meetings at the table and various ways of spending free time. This is important, especially if we are talking about a place that is to shape the development of the southern part of the city” – comments Karolina Prędota-Krystek, senior leasing manager at Echo Investment’s Shopping Centre Department. In addition to the cinema, a modern fitness club and a wide range of restaurants and cafes, a bowling alley with a bar, its own pizzeria and space designed to organize various events will be opened at the junction of Kościuszki and Kolejowa streets. Another eye-catching place will be a sport & social club, which will be opened by Poland’s football representative, Arkadiusz Milik. The club is in line with style of European sports pubs, will be connected with over a hundred-meter terrace. The terrace will also be available for other guests of food corner of the project developed by Echo Investment. The first multiplex cinema was created 20 years ago in Poznań. Currently, there are over 1300 screening rooms in nearly 500 cinemas in the whole country. Since then, the cinema market has been recording steady growth. Analysts of Cushman & Wakefield, one of the leading agencies in the commercial real estate market, indicate that last year the average increase in tickets sold compared to 2016 was 8,7 percent, which means that in 2017, 56,6 million viewers bought cinema tickets. Importantly, the average ticket sales growth in Europe is 2 percent year on year. Experts emphasize that despite the fact that multi-screen cinemas, two or more rooms, are only a quarter of all cinemas in Poland, considering the number of screens, their share increases to 75 percent, of which 80 percent of them is located in commercial complexes.